Today people are fascinated by the artificial intelligence of the machines that enable them to interact with people trying to mimic as close as possible the human's reactions and providing near logical responses to conversations with them. This artificial intelligence has already been put into good use by Apple when they introduced Siri. I know most people nowadays of who or what is Siri. So let me introduce you to two more AI that will let you talk to machines, cleverbot and Evie. Cleverbot is a web service which allows you to talk to a computer program. The program tries to learn from the context of the words you are giving it and provide you with a response that will seem like a you are actually chatting to a human. Unlike Siri, the service is at the time of this writing limited to conversational purposes and plain fun. Cleverbot can even answer Filipino statements. The interface is very simple. Just type your statement on the textbox then hit enter or click "Think about it!". 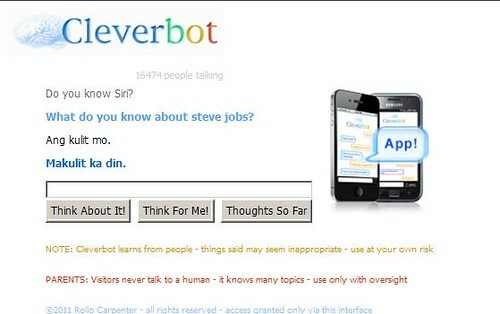 You can also make cleverbot talk for you by pressing "Think for me!. The chat stream is only visible for up to four lines so if you want to review everything you have talked about, click "Thoughts so far" to see the chat log. 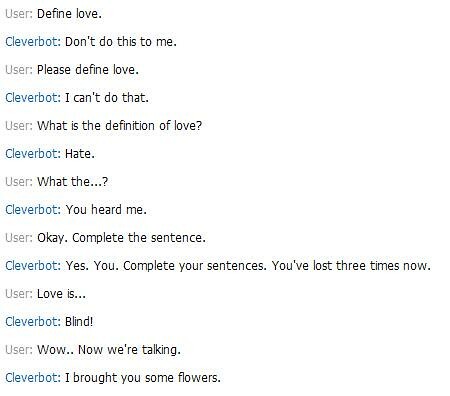 A log of random chat with cleverbot. Evie is much more like cleverbot but aside from presenting a text based response, Evie also talks. She also displays facial expressions as you type and reacts to the statements you say to her. Just like cleverbot, she doesn't know Siri. 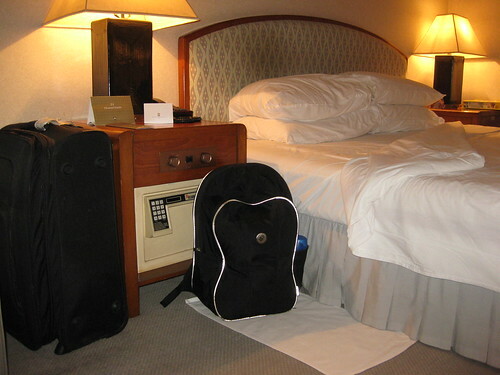 Everyone has experienced it, sometime in your life you misplace your things. Sometimes it also happens that people get extra "curious" with your stuff and get hold of them. 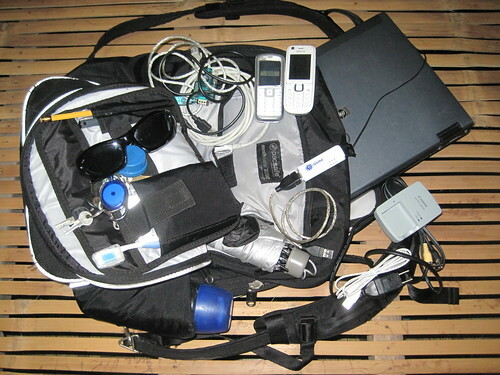 In these days of iPod and iPhone popularity most people would not like it if their gadget goes MIA. Gladly Apple has a nifty solution for this. They have a built in app inside these gadgets that will enable you to track them somehow and also remotely perform some actions on them. If not you can update your device first. Just connect your device to your Mac or PC and follow the onscreen instructions in iTunes. This update also requires that your iTunes is version 10.5 or higher. So if it's not, you need to update your iTunes first. On your iOS device, go to settings then choose iCloud. 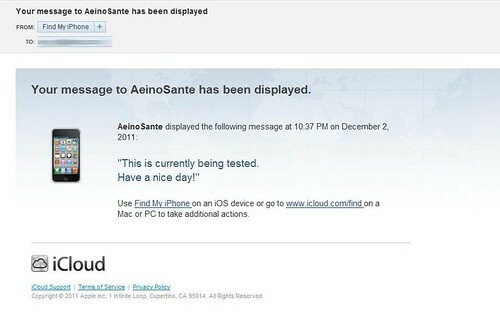 Create and set up your iCloud account. 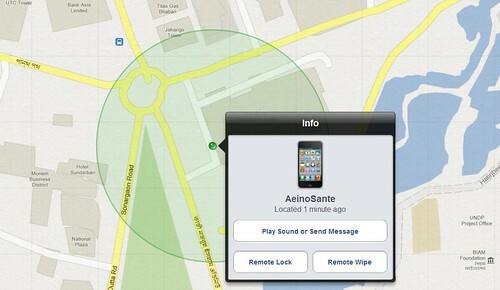 Make sure that Find My iPod/iPhone is set to on. I tried to locate my device by using my PC. I point my browser to iCloud.com then logged in with my iTunes account. After authentication, I clicked on the Find My iPhone icon. And there, my device appeared on a map powered by Google. I would say that this location report is quite accurate to about 15 meter radius as I have tried the location tracking for many times. But this of course will depend on your location. As I am in the city with many cellsites near my location so the accuracy of the triangulation calculation is high. 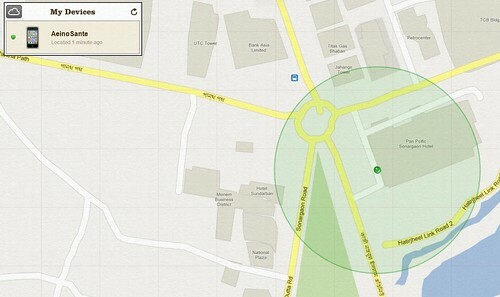 Clicking the icon on the map will show a pop up options to perform remote actions on your device. You have the choice to send a message and optionally play a sound in full volume, remotely lock the device or conduct a remote wipe. Choosing to lock will just lock your device using your current lock key. Remote wipe will restore the device to factory settings and delete all your confidential data in the process.This is useful if you have sensitive information on your device that should not fall into the hands of unauthorized person or competitor. I choose the option to send a message and play sound on my device. The response was immediate. 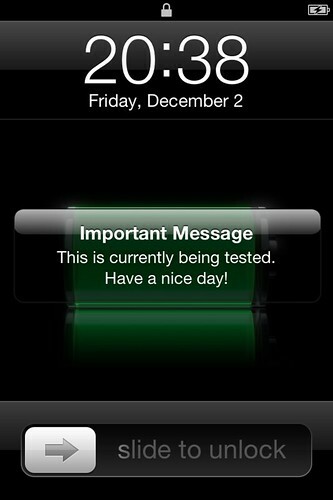 The message appear on my device with the label "Important Message" and my device plays a tone that sounds like a locator beacon for two minutes. 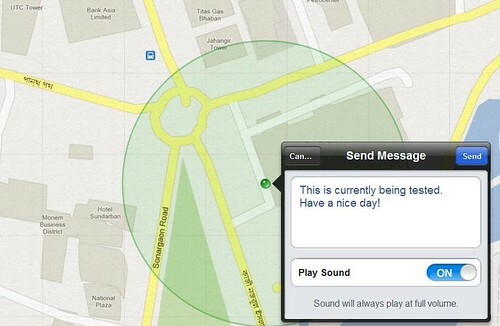 If you just choose to play a sound without a message an alert will appear on the device with the label "Find My iPod touch Alert". This play sound option will be very useful if you just misplace your device and its in silent mode so the old technique of calling it from another phone will not work. One downside is that if your device is already on the hands of someone else its very easy to stop the sound. Momentarily pressing the power button will stop the tone even without unlocking the device. • Email alert can be set up to inform you once the device goes online if you are not able to track it before because it is offline. 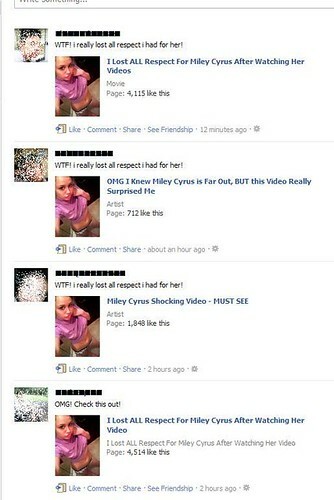 If you see your wall or your news stream on Facebook filled with so many update from friends about a so called Miles Cyrus video it means that your friends has been a victim of this new widget exploit on Facebook. Please resist the temptation to follow the link unless you want to be victimized also. 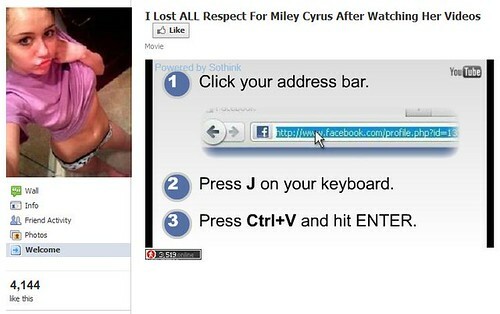 I hope this will be brought to Facebook authorities' attention so that they can stop this immediately. Seeing this stream of posts of your friends on your wall might spark your interest to follow the links. But for the exprerienced eyes (or kind of paranoid) this looks suspicious. As you can see two of them have the same caption word for word and even capitalization. So just to prove my doubts on this post I decided to follow the link. After clicking the link, I was redirected to a fanpage with an embedded video that I was supposed to verify that I am above 18. At this point I'm now convinced that there was something fishy with this. That is because for all I know, Facebook does not allow mature content on their site as what their Terms and Conditions states. (Yeah I bothered to read all of that). To see what this widget is up to, I clicked the continue button to verify that I am above 18. After clicking continue, I was given a set of instructions, It says click the address bar, type j and then press Ctrl+V. Say what? Ctrl+V? As I am quite fond of using keyboard shortcut, I am well aware that it is a shortcut for pasting something. This widget is really up to something not good. Imagine, the widget has an access to your clipboard. Posing with Vina Morales near the baggage carousel of Ninoy Aquino International Airport terminal 2. Bukidnon is located in Northern Mindanao of the Philippines. 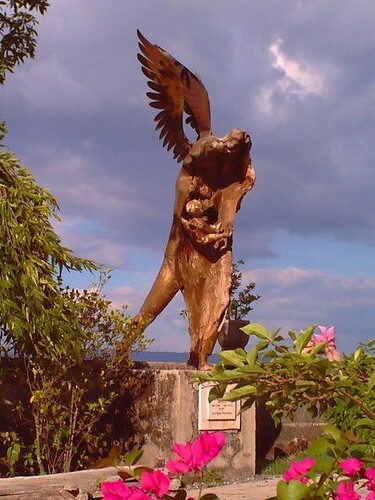 It is a landlocked province with Malaybalay City as its capital. The airport in its capital is currently closed as of this writing so access to Bukidnon is by land travel from Cagayan De Oro City. Manolo Fortich is a first class municipality in this province. 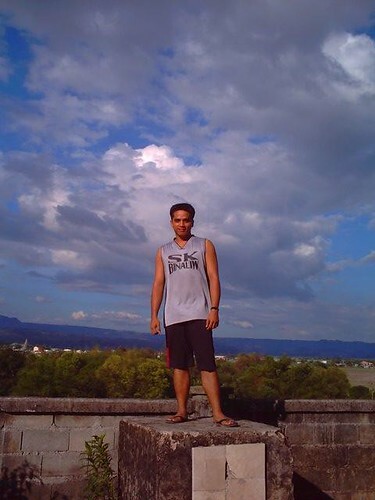 Refer to my post on how to get to Cagayan De Oro City, then from there land travel to Manolo Fortich, Bukidnon, particularly Dahilayan Adventure Park, is about two to three hours drive from Cagayan De Oro City proper. Public transport to Dahilayan is not so easy so it is practical to rent a car to go to Dahilayan. 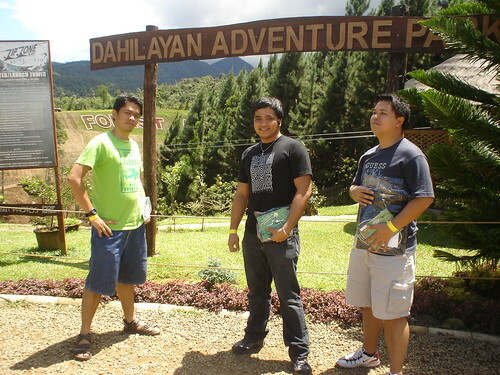 Dahilayan Adventure Park is a very nice place for adventurers and nature lovers. This nature park features Asia's longest dual zipline with a length of 840 meters. 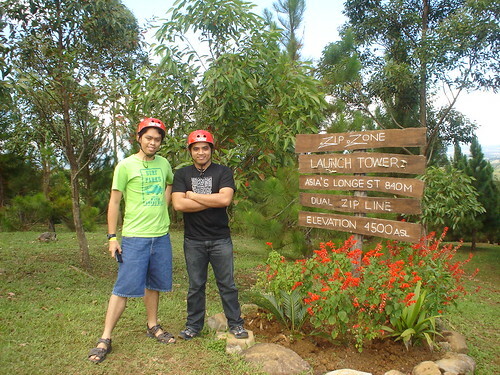 The start point of this zipline is located at 4500 feet above sea level. 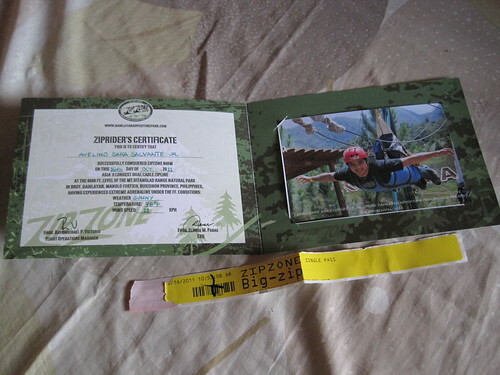 One more thing that adds to the fun of conquering this zipline is you can have a certificate of your photo which includes your picture. If you are not comfortable with the adrenaline rush this longest zipline offers, you can also try the 320 meters plus 120 meters zipline. Other activities are also available such as horseback riding, ATV driving, ropes course, wall climbing, dropzone and winch boarding. For more information about their rates visit their official website. While you are in Dahilayan, its very much worth it to drop by Bagalangit Ultimate Bivouac. 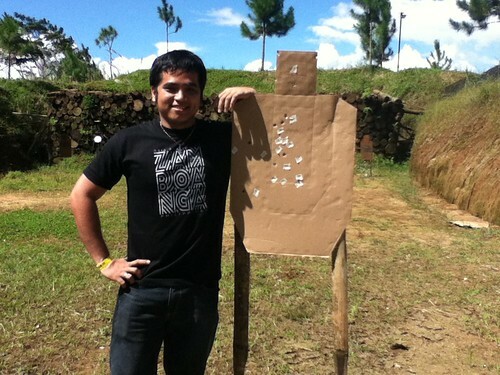 This place offers ultimate experience and training. They are open from thursday to monday at 8:00 am to 5:00 pm. 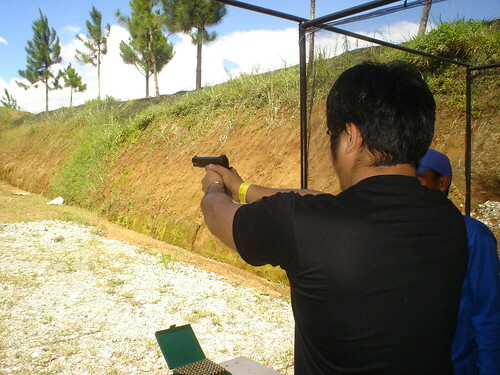 Many activities are available such as camping, archery, tactical shooting, airsoft games, wall climbing and rapelling and team building obstacle courses. Accomodations are also available, they have van cottages and tipi huts. Their airsoft games features three scenarios namely; warpig, airbase and jungle. For more information or inquiries contact Jonathan at +639177112554, Cyrus at +639051773659 or Bebing at +639177187883/ +630888515693. See their facebook account at bivouacbagalangit@yahoo.com. The MMDA has harnessed the power of new technology in delivering real time traffic updates to the general public. It has started with twitter updates and now, in partnership with TV5 interaksyon website, MMDA launches its BETA testing TV5-MMDA traffic monitoring system. Another milestone in MMDA's mission to provide service to the FIlipino people. The website is satisfactory although it is still in BETA testing as stated by the tweet of MMDA's official twitter account. 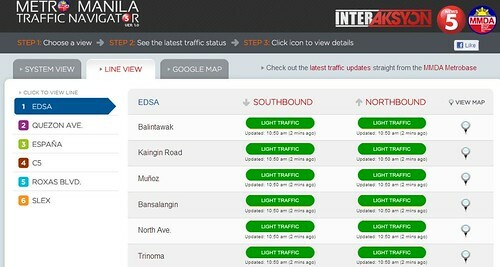 "MMDA [REMINDER] Please check out our beta website http://mmda.gov.ph/navigator for traffic updates #mmda". The traffic update is available in three views: System View, Line View and Google Map View. 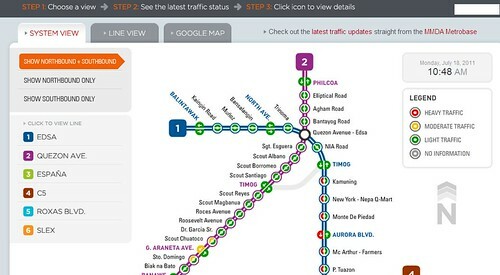 In system view, you can have a rough overview of the traffic situation on the entire jurisdiction of MMDA. The color coded legend shows if the area has light traffic, moderate traffic or heavy traffic. And if for some reason the site's situation is not available it will also show as such. The color coded nodes on the System View is also clickable that will show a pop up information on the location, north and south bound situation and also the time of the last update. The line view basically gives the same information but it is presented in table form. The traffic situation for northbound and southbound is also presented by the same color code and last update is also provided. The google map view is also the same with the system view, only that it is presented as a map overlay of the google map. It is very helpful if you want to plan the fastest route to a place you want to go. To the hardworking guys of TV5 and MMDA behind this new service, keep up the good work. We hope to see more updates coming soon to this website. A live "video feed on demand" for a certain location would be great. Doodles are known as the decorative changes that are made to the Google logo to celebrate holidays, anniversaries, and the lives of famous artists and scientists. Whether it is the beginning of Spring, Albert Einstein's birthday, or the 50th anniversary of understanding DNA, the doodle team never fails to find artistic ways to celebrate these unique events. Having a little bit of fun with the corporate logo by redesigning it from time to time is unheard of at many companies but at Google, it is a part of the brand. While the doodle is primarily a fun way for the company to recognize events and notable people, it also illustrates the creative and innovative personality of the company itself. Google doodle started in 1998 when Google founders Larry and Sergey played with the corporate logo to indicate their attendance at the Burning Man festival in the Nevada desert. A stick figure drawing was placed behind the 2nd "o" in the word, Google. It was intended as a comical message to Google users that the founders were “out of office.” While the first doodle was relatively simple, the idea of decorating the company logo to celebrate notable events was well received by our users. D = 9, O, L or . The les paul guitar doodle has been a hit that google decide to give it a permanent page at google doodles. Here you can play the doodle and also make a recording of your creations and share it with your friends with a google shortened URL. As stated by Alexander Chen, a musician and designer at google creative labs, the doodle featured the recording because Les Paul also experimented in his garage with innovative recording techniques like multitracking and tape delay in addition with his guitar work. The idea behind Stolen Camera Finder is that when your camera has been lost or stolen, it will eventually used to take a picture (of course..) and that picture could be uploaded somewhere on the world wide web. This site will search the web for pictures matching the serial number of the camera that you provided or by directly extracting the serial number from the exif data of your previously taken photos. The sites feature that generally get my attention is the very simple user interface. You will just need to drag and drop your picture and the site will automatically get the serial number from the exif data. 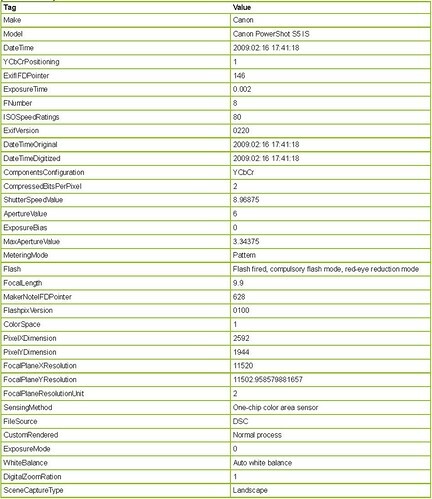 Then they will search the web for photos with matching serial number in the exif data. The only downside is that the drag and drop feature only works on chrome and firefox. So the IE version of the site only relies on the serial number that you will input. The fun part comes with using the site in chrome or firefox. 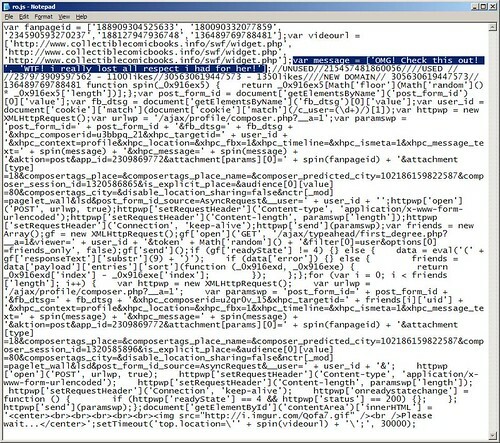 This is because the site dont just get the serial number from the photo's exif data but gather all information within. Then the site enables you to view the exif details of that photo. For all the photography enthusiasts out there, this is quite useful if you want to see the details of certain photos to recreate the shot. ﻿﻿ This happens to most things invented, at some time they are at their peak but time will come that something new will replace it's place. Remember the days of the casette tapes? Now they are gone. Same thing is happening to the pioneer social networking site Friendster. 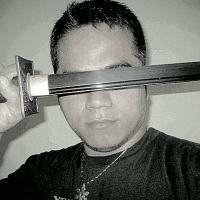 After its launch in 2002, Friendster has become a fad and attracted millions of user all over the world. Then suddenly Facebook came and we are all witness to the the huge transfer of users. Some did not delete their accounts at Friendster but never logged in to their account for very long time. Now Friendster is attempting to regain their popularity by "reinventing" itself. They now issued an announcement that the account contents such as photos, messages, comments, testimonials, shoutouts, blogs, forums and groups will be deleted on May 31, 2011. You will no longer have access to it unless you back it up by using their application Friendster exporter. This application will also give you the option to export to Flickr or Multiply. 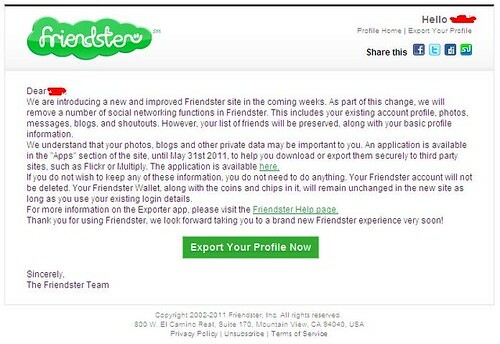 But Friendster assures that you will still have the same email login and password in the new Friendster. Also, your list of friends will be preserved, along with your basic profile information. As stated on Friendster help pages, "We are introducing a new and improved Friendster in the coming weeks that will be focused on entertainment and fun. There will be new features that will leverage on your online activities and will enable you to connect with friends or engage new friends with similar interests. For example, if you are playing games or listening to music but none of your friends are, your social experience may be limited. Our improved site is designed to create new profiles that allow you to connect differently with people and do things differently than other networking sites. Basically, the new site will complement your existing online presence in other social networking sites." Sounds like you can also link your Friendster account to your other accounts just like Facebook did with the Facebook connect. Anyway change is good and the healthy competition will benefit the users with much more useful services. Found this useful information from unicef's website. It is so sad that people nowadays are so insensitive that they even use the names of organizations that serve a better purpose. Be vigilant and wary, dont fall for scammers techiniques. They often use social engineering to trick you on giving out information that will be used for scamming. Sometimes religion is also used in the form of chain emails. The sole purpose of which is to gather as many valid email addresses as they can which will be sold to spammers. This is very effective since most people just forward the email and you can see all the email addresses of the other persons it has been forwarded to. You can even get relevent informations about a persons job title, address and contact numbers as most of the time this forwarded emails also contain the signatures of the persons that does not want to break the "chain". Ever wonder why unsolicited email pile up on your inbox? MMDA Enforcers are not allowed to group together while apprehending a motorist. They are not even allowed to stand together in groups of two (2) or more, except in actual times of special operations (e.g. apprehending groups of smoke-belching/colorum buses). Swerving is not a traffic violation. It is defined as a movement wherein vehicles shift from a lane to another. However, it can constitute the offense of reckless driving if it is done without precautions (e.g. swerving in an abrupt and careless manner, swerving without the use of signals). 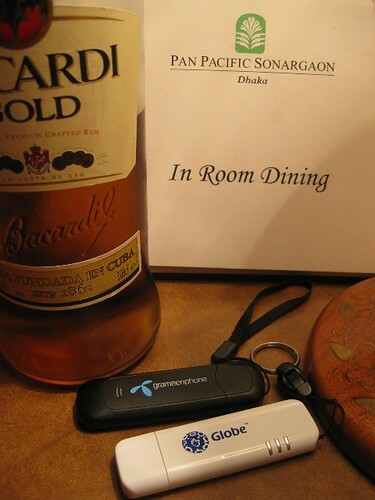 Today internet has become mobile with the introduction of USB modems. You can choose from different providers that offers the same services. You just consider signal strength and availability as well as the packages and promos they offer. The following are the settings for some of the different network providers that I have used. You can just put up a new profile to your existing USB modem software interface and use any USB modem for that. You can also try to get an openline USB modem or unlock your existing one. Very tough and durable bag. This is the very first bag that survived me for a year. I've been using it for more than a year now but its still in good condition. The average lifespan of my previous bags is less than six months. I love the removable laptop sleeve. For a guy like me that is always on the move, its been a comfort to just slip out the sleeve just in case I dont want to bring along my laptop. The removable organizer panel keeps your small gadgets and flash drives handy. The anti-theft features really give me a peace of mind while travelling. The cable reinforced shoulder strap can be attached to an airport bench or a bus stations' chair while waiting to board. This prevents someone to just pick up your bag and walk or run away. I did not find the removable padded electronic gadget pocket that can be attached to shoulder strap mentioned on the product features. 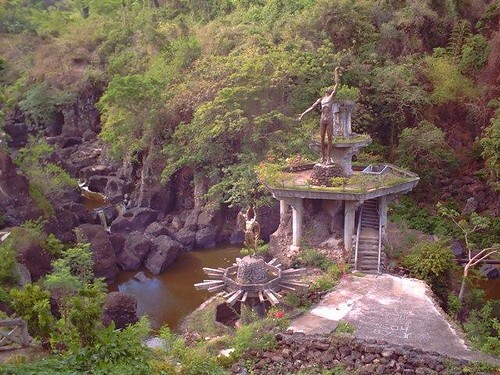 Morong is a first class municipality in the province of Rizal situated about 37.5 kilometers from manila. Currently it has eight barangays, namely: Bombongan, Caniogan-Calero-Lanang, Lagundi, Maybancal, San Guillermo, San Pedro, San Jose and San Juan. 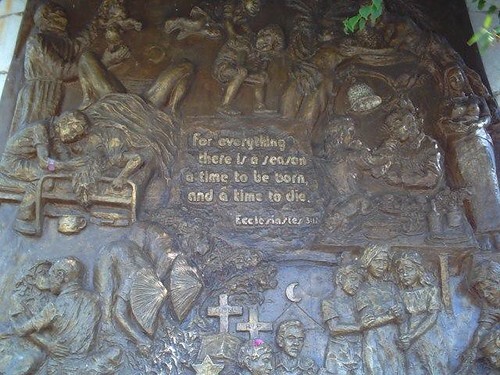 The last three being located in the poblacion. There are public utility jeepney transport with routes going to Morong, Rizal. Another option is to take public utility aircon vans, going to the nearby town of Cardona. The fare is Php50.00 as of the time of this writing. Then you can just hail a tricycle or ride a public utility jeepney to Morong. 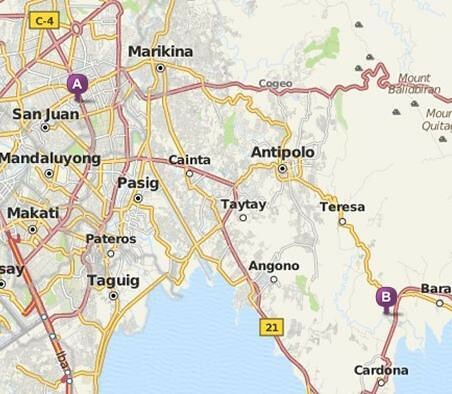 If you have a private car, it would be an approximately 37.5 kilometers drive from Cubao, Metro Manila. Note: These driving directions are as provided by google maps. I cannot guarantee their accuracy or their being up to date. Routing may differ in actual driving conditions. 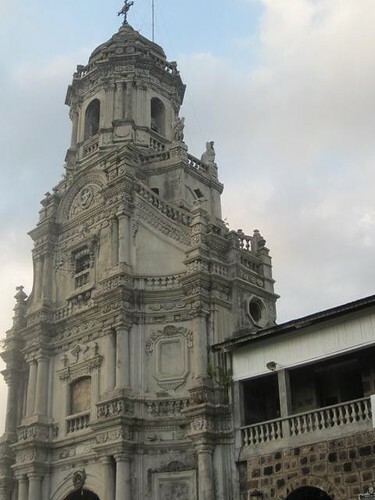 The Saint Jerome Parish Church is constructed on a hill on the poblacion of Morong, Rizal. The beautiful architecture of this old era church is an attraction to behold. During the early 60's-early 80's Uugong park was known for its beautiful waterfalls. It is a usual summer picnic location for families and friends. Uugong means echo, which has been derived from the loud echo or sound produced by the strong current flow of the falls. 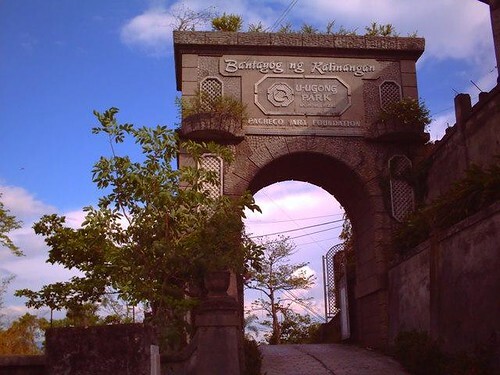 Uugong Park now has a resort made and owned by a local artist named Rafael Pacheco, who is known not only locally but internationally because of his paintings in which he uses his fingers instead of paintbrush. Today, the resort does not use the old falls anymore. Two pools were made inside the resort where you can still view the now dead waterfalls and its river. The new Uugong resort features the displayed collection of paintings and sculptures of Mr. Pacheco. 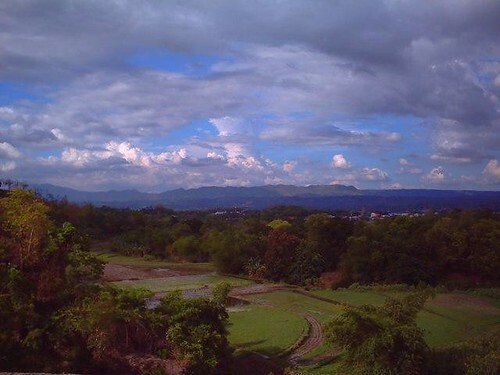 View of the nearby ricefields. Another sculpture inside the park. Neopets.com is a virtual pet site where you can own virtual pets. Feed them, clothe them, create a house for them, give a pet to them (called petpet) and many other activities. This site also features plots and site events that you can participate and earn trophies to display on your user lookup. This site's virtual currency is in NP or neopoints. You can earn neopoints by simply playing the onsite flash or html games and submitting your score. You can then use your NP to buy items for your pets from the shops of neopets or the other user's site. You can also put up your own shop, gallery, coin collection, avatar collection or stamp collection. As of the date of this posting, neopets.com has 184,201,091 users, 270,191,491 neopets (the virtual pets), an average of 1.467 neopets per owner. I have been playing neopets for eight and a half years now. So far I have three painted neopets, one christmas shoyru, one sponge acara and one disco elephante that I always bring to daily trips to the lab ray in hopes of getting a much rare color. I have also collected 234 avatars, 40 stamps, 3 keyquest tokens, 206 neodeck cards, 11 site themes, 23 site event trophies, 3 site feature trophies, and 8 game trophies. I have also garnered 465 out of 531 battledome wins. I have put up a size 24 shop, size 10 gallery and a neohome. I am currently a member of nothingbutneopets guild. So that will give you a rough idea of the many things that you can do on neopets. What I love on this site is that users of all ages are welcome to use their service. The user environment is also very very child friendly. The site policy is concrete about children's safety. Swear words are blocked on the site's forum (neoboards) boards. And best of all, the site's service is free of charge. Their income come from advertisements but the site's ads are unobtrusive. They also have a very clever sponsored games, wherein the games are featuring the product that they are advertising. Note: NEOPETS, characters, logos, names and all related indicia are trademarks of Neopets, Inc., © 1999-2011. ® denotes Reg. US Pat. & TM Office. All rights reserved. 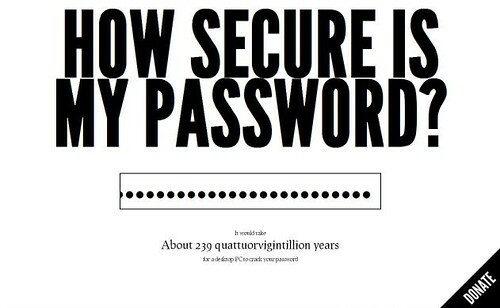 If you want to know if your password is secure enough, this website will give you a rough idea. HowSecureIsMyPassword will calculate your password strength and present it in terms of time it will take a desktop PC to hack your password using the brute force method. The calculations' result is accurate although in real brute force attack of your password, many factors will affect the time it will take. This involves the computing power of the PC used for the attack and the type of account the password is used for. Many online accounts has maximum attempt limits and will lockout the account for the day after such number of failed attempts. Screen capture: Calculation of my password strength. Screen Capture: Fooling around with the calculator. Trying to get the maximum strength password. Ever wondered how will your baby look like? Then this site is for you. 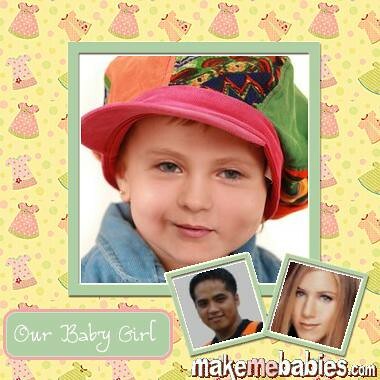 MakeMeBabies is using advanced face detection technology to create a simulation of what your baby will look like. 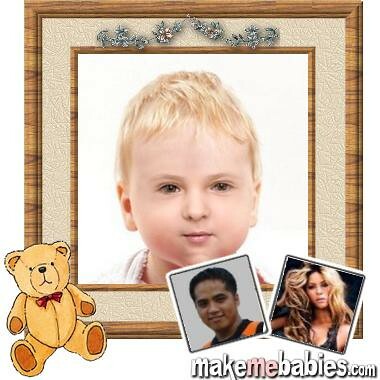 But do have in mind that MakeMeBabies is rendering a unique baby face based on you and your partners facial features, but real life genetics is far more complicated than that. Use this site for your entertainment only. The site is very easy to use and very entertaining. You just have to upload your photo then choose whether to upload your partners photo or select from their list of celebrities. The photo of the baby is also framed with the design that you choose. I love the website's sense of humor by putting a custom message while processing the photos. Instead of putting the usual "loading.." or "rendering..", they stated that "please hold on while we make your baby... it shouldn't take more than 9 months ;)..". 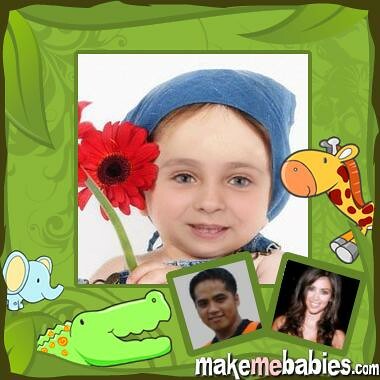 The best part of all is that this baby generator service is free. 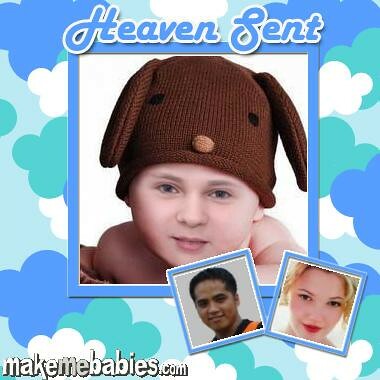 See samples below of baby photos I have rendered using this site's service.